There’s something special about a city skyline. They’re gorgeous, mysterious, and make a great accessory too! 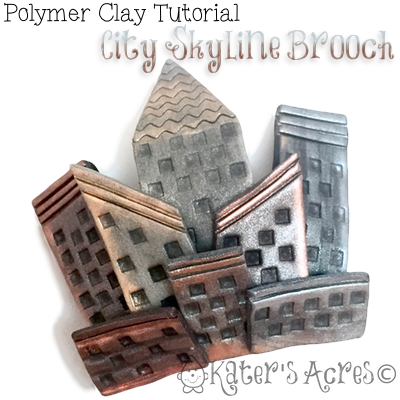 This free polymer clay tutorial will show you the basic steps to making your own polymer clay skyline brooch. Enjoy & feel free to share. In February it was my honor to feature the fabulous Melissa Terlizzi here on KatersAcres. Today’s project was inspired by the beautiful brooch she made from metal clay several weeks ago. First gather approximately 1/4 to 1/2 bar of silver Premo! clay. Divide that clay into 4 equal portions. Mix ONE other color with each portion of silver to slightly TINT the clay (see picture at left). I used Premo! copper, granite, bronze, and rhino grey to tint my silver colors. Roll the clay on the 3rd largest setting of your pasta machine. Cut out some basic house shapes in different sizes. Decorate them with windows, doors, and roofs as you see fit. Once you have made all the windows, roof, etc, use black chalk powder and dust each piece. Use a baby wipe to wipe the surface of the clay clean leaving the black powder only in the crevices. Line your three largest buildings up. Place a half round on TOP of the buildings for structure and support. Place the other buildings on the half round, concealing it and adding dimension with the other building placements. Once all your buildings are placed the way you’d like them, choose three gorgeous metallic colors of your choice and lightly dust the top & sides of your buildings to add a metallic effects for sparkle and shine. Bake in your polymer clay dedicated over for 45-60 minutes at 275 degrees if using Premo. Once your city skyline is baked, add any additional details with acrylic paints and a small brush. Add a pin back to the back of the brooch and cover with textured clay. Adhere to the back of the brooch using some Translucent Liquid Sculpey, and bake for 45 minutes at 275 degrees. OPTIONAL: Make yourself some cute little earrings to match! Free polymer clay tutorials are made possible by Parker’s Clayful Tutorials Club Members. Join the Club now!